This nutritious and delicious dish is called “Buddha Bowl” because it’s full and rounded just like Buddha’s belly. 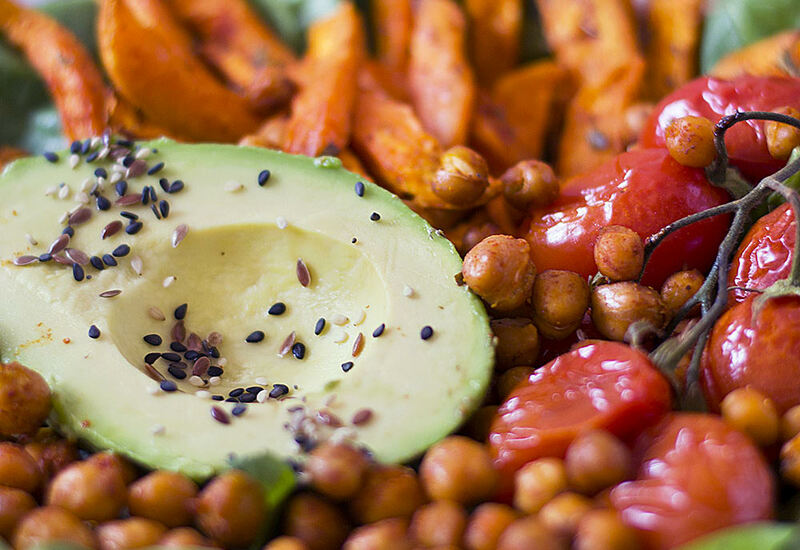 Avocado, sweet potato, seeds, and spinach bring so much color and flavor to this delightful vegan bowl. Make the roasted veggies ahead of time, and you'll have ingredients for several meals throughout the week. This meal is so versatile! Swap white beans or black beans for the chickpeas. Add quinoa or brown rice. Chop fresh herbs like parsley or cilantro to mix with the spinach. Use kale or chard instead of spinach. Mix fresh garlic into the chickpeas and sweet potatoes about halfway through cooking. The options really are endless! Per Serving: 508 calories; 25g fat; 63.1g carbohydrates; 14g protein; 0mg cholesterol; 658mg sodium. Delicious! We have a little one who can't eat fresh spinach yet, so we mixed frozen in before baking. I was sold on this recipe just reading the title and the ingredients! The roasted veggies are fantastic and topped with seeds and lemon, this bowl is simple and delicious. I might go for a fried egg on top next time. Such a good buddha bowl! I make this recipe whenever I am feeling under the weather. It always helps! It's like healthy comfort food.